Keeping the house clean is a tough job. 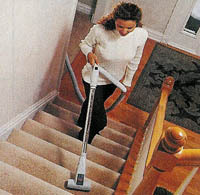 With a central vacuum, it can be a little easier. A 30-foot hose plugs into the inlet on the wall and instantly, there is enough suction to pick up almost any mess. The debris is sucked through the pipes in the walls and out into a canister in the garage. Powerful, hypoallergenic and quiet . . . What more can you ask for?